When Janet Allen entered the teaching profession, she was shocked by her students' lack of enthusiasm for reading. In desperation, she turned to pearls of wisdom from her mother and created an approach to teaching reading that worked for her middle and high-school students. Later she discovered that her method had a name -- "shared reading" -- and research to back it up. Now hers is just one of the voices promoting this strategy that produces engaged learners and better readers through read-aloud experiences. Included: Tips for a successful start to shared reading in the middle and high-school classroom! "I decided early in my life that I would be an English teacher and thought I would have students who loved reading as I did," explains Dr. Janet Allen, an author and expert on the teaching of reading. "Yet, when I started teaching, I found I was encountering hundreds of students who couldn't or wouldn't read. I was stunned by that. Reading had played such an important role in my life; I couldn't imagine not wanting to read." * If you aren't used to reading aloud to/with older students, begin with shorter texts you know students will like -- poetry, short stories, interesting news articles, or the beginning of a new novel on which a popular movie has been based. * Practice reading aloud before you read to students so you can offer a fluent reading of the text. * Ask students to follow along. This will increase their vocabulary, and that's what makes it shared reading. * Don't interrupt the reading too often for a teachable moment; read through the text first, then return to the text for the teaching point. * Read in such a way that the text comes alive for students. Change your voice for characters, offer asides when appropriate, laugh or cry when you are moved by the text, and choose a text you enjoy reading. Then Allen remembered a bit of her mother's wisdom. "My mother said that the only babysitter she could hire for me was one who was willing to read to me all day because it made me act better," she said, adding, "These were tough classes and acting better was certainly a goal, so I started finding multiple copies of books, short stories, poetry, and newspaper articles and began reading to them, inviting them to follow along as I read." Students were more motivated to read. Attendance improved when students didn't want to miss what the class was reading. Students' speaking and writing vocabularies were changing to reflect the texts they read. The class was more like a community and less a collection of individuals who happened to be in the same place. Students began to see themselves as readers. Many of Allen's students had missed out on the "lap-reading" experience of childhood -- several years of someone reading to them every day. Shared reading seemed to fill this gap. It also provided the opportunity to see and hear words in a context that is both meaningful and memorable. "This approach changes attitudes toward reading," observed Allen. "For many students who have struggled in school, reading has come to represent failure, risk, embarrassment and struggle. Shared reading is a place where everyone can find success and those walls begin to crumble. Success breeds success, and these shared experiences set students up to want to read something else." The first step in using shared reading is the selection of the text. Allen believes that the material need not be a novel. Shared reading can be used with any type of text. The second step is for the teacher to read the book thoroughly before reading it to the class. "There are several reasons for that," Allen told Education World. "Teachers shouldn't be surprised by the content, which may have language or events they would rather not read out loud. The practice of reading the text through one or more times helps with the fluency you are modeling while reading, and the text should be mined for teaching possibilities and word study." Allen advises that it is important to teach what "really matters" connected to a shared text. "We always want students to leave each reading experience enriched by the language and the text because of the shared approach, so we shouldn't find hundreds of vocabulary words and instructional opportunities in a single text," she said. "Perhaps there will be a word each day of the reading that you might want to explore with your students. A longer text might lend itself to one or more reading strategy lessons used to model for student readers how they might overcome the challenge of reading a book independently. There also should be one or more points in the text that would serve as a model or impetus for writing workshop." It also isn't necessary to use shared reading with an entire text. It might be ideal to start a novel with this approach to introduce its complex aspects and then have the students read the rest of it independently. Although it may be more common in the early grades, Allen says that shared reading has great value at all levels. "We shouldn't abandon the opportunity to share words in interesting ways just because children get older," Allen added. "The shared approach provides access to words, to knowledge, to information that will change a life." Teaching sixth through eighth grade social studies and history at Liberty Middle School in Orlando, Florida, Christine Landaker has used shared reading to provide "touchstone texts" for her students that relate to their social studies units. "Not only does shared reading provide a text we can all refer to, it also is the time at the beginning of each class period when we get into history learning mode," explains Landaker. "The kids come in, get their portfolios and a copy of the book, and they sit down and get ready to read. Usually we have a brief recap of the reading from the day before, and then we read for about 15 to 20 minutes, depending on the stopping point I have chosen, which isn't always the end of a chapter. I go for something that will leave the kids hanging!" Shared reading has helped Landaker integrate reading and literacy instruction into her social studies units. Her students think critically about historical fiction and connect more with what they are learning because of this approach. She has observed that her students are probably more attentive during this portion of the class than at any other time. "During Bud, Not Buddy by Christopher Paul Curtis this past year, attendance actually improved in my class," reported Landaker. "I heard things like, 'No, Mom. You have to change my appointment so I don't miss U.S. history. We're at the good part in Bud, Not Buddy.' When students did have to miss, they came to me first thing in the morning when they got back to ask what had happened while they were out. This isn't the norm for every book, but it demonstrates how into it they can get." In her new assignment as an eighth grade English teacher at Charles Pierce Middle School in Milton, Massachusetts, Landaker is certain to call upon shared reading as a teaching strategy. But she won't be disappointed if every text isn't as popular as Bud, Not Buddy, and she doesn't think that others should abandon shared reading if at first they don't succeed. "Don't be hurt if they hate a book," she advises. "We have to remember that what we love doesn't always translate to the kids. And don't be afraid to stop reading it if they hate it. I think it affects your credibility with the approach to reading if you tell them all these wonderful things, and then it turns out to be just as boring as the textbook." She added, "If you're not already into young adult literature, ask for titles from colleagues. Most of the books that I have had such success with were recommended by people with whom I work. Allow the kids to surprise you with what they wonder or the connections they make. Find something that you and the kids love, and let it lead you." HIGH SCHOOLERS GET TO THE POINT BY GETTING "LOST"
"I use shared reading to engage kids in reading," said Lee Ann Spillane. "If they have never experienced the feeling of being 'lost in a book,' they will experience that during shared reading. Many of my high school students tell me that they have never read an entire book on their own; others say that they haven't read a book on their own since elementary school." Spillane is a ninth grade English teacher at University High School in Orlando, Florida, who relies on shared reading to build interest in a text or theme, to build students' background knowledge, and to teach content. "When I read an engaging and interesting text to my students, they beg me to keep reading!" Spillane said. "They'll say, 'Please, please, just one more chapter!' So, in my classroom, shared reading hooks kids. Shared reading is what enables me to turn my students into independent readers. Once they hear how a story can sound when it's read by a fluent reader, they want to hear that again and again and again -- until they can replicate that sound in their own minds when they read silently to themselves. When they can hear that fluent reader's voice in their own minds while they read, they take off as readers." In her class, shared reading works for Spillane because she uses it consistently and chooses appropriate texts -- ones in which she and the students, as a reading community, can get lost in and care about. "Just the other day my students and I were reading poetry from the novel Tears of a Tiger," she recalled. "The students wanted to write their own poems like the poems the students had written in the novel. So, after the shared reading we went back to the poetry and examined commonalities. The students deduced that the poems were made up of stanzas, that they rhymed, and that they even followed a rhyme scheme. I then put one of the poems on the overhead so that we could look at these poetic elements more closely. I used shared reading of a novel to introduce and do a mini-lesson on poetic elements. That mini-lesson carried over into the students' writing and will also carry over into further studies of poetry as the year progresses. Shared reading is a great springboard for teaching content because it allows students to begin learning from a common experience, the shared reading." 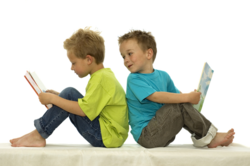 Dr. Janet Allen, expert in the teaching of reading and author of On the Same Page: Share Reading Beyond the Primary Grades, offers a few of her favorite texts for great shared reading experiences at all levels. Added Allen, "There are some wonderful collections of poetry that I would use in a classroom by 'new' poets like Sara Holbrook, Paul Janeczko, Billy Collins, Maya Angelou, Naomi Shihab Nye, Jo Carson, April Halprin Wayland, Nikki Giovanni, and selections from poets we have long enjoyed such Emily Dickinson, Robert Frost and e. e. cummings. In some of the schools where I work, teachers create their own poetry anthologies so they can share a poem a day: student poems and published works." In information texts, Allen suggests Oh, Yuck! The Encyclopedia of Everything Nasty, Masoff (I, MS, HS), the Horrible Series from Scholastic (I, MS), and the Janet Bode and Stan Mack books with interviews with teens in juvenile centers, Hard Time: A Real Look at Juvenile Crime and Violence (HS).